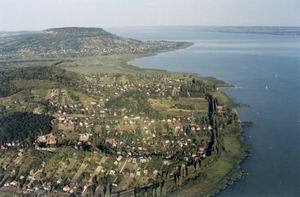 The village of 1,000 inhabitants located in the neighbourhood of Badacsony was an island at the time when the level of water of Balaton was higher. Nowadays its area is a peninsula jutting out far into the lake. There are only a few places in Hungary presented with so much natural beauty as Szigliget. On its rocks you can see the more than 730-year-old castle built by the abbey of Pannonhalma in 1262. The houses of the village with thatched roofs are located downwards from the Castle, graded one under each other, in a semicircular order. New streets down in the valley hidden at the foot of Majális Hill, Kámon Stone, Soponya Top, ´Queen´s Skirt´ and Akasztó Hill, getting down to the lake-shore. A small village with a church had been developed under the Castle belonging to it as usual in the life of a border fortress. The Castle passed into royal proprietorship and then from 1521 for centuries it became the property of Tóti-Lengyel family. The Turkish tried to take the Castle on the top of the steep hill several times but they always failed, however, they burned down all the villages around it. At that time the Castle was the strongest point of the system of border fortresses at North-Balaton; it served the purpose of a harbour for the Hungarian "fleet". Upon the order of Emperor Leopold issued in 1702 the Castle was blown up. The characteristic structure of the village has been saved, the whole internal territory of the village is protected. The Tóti-Lengyel mansion under the Castle was built in baroque style, currently it operates as a restaurant. The neoclassical Esterházy mansion in the centre of the village is a rest-house for writers today. Its 12 ha park is a protected botanical garden (e.g. 150 species of pine-trees grow here). The remained tower of Avar church of Árpád-age (Broken Tower) is situated eastward of the village, above the former port. A new sight of Szigliget is the sailing port which is connected harmoniously to the old port. 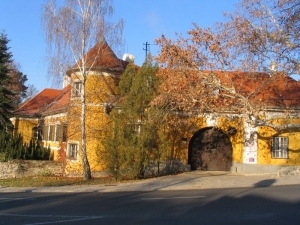 Szigliget Gallery in the building of the former elementary school with a thatched roof is next to the Catholic church. Exhibitions are free of charge. The professional show of three craftsmen (glass-engraver, potter, textile manufacturer) can also be seen. In summer mediaeval fighting show with horses and knights is organized in the evenings. An outstanding event of the various high-standard programmes offered all year round is the Szigliget Summer Days (folk dance, concerts of brass bands, sports and pop music programmes), which is held in the first weeks of August. The autumn programmes include the Vintage festival and the Pike-perch Festival. There are exhibitions from July to the end of August in the gallery. The natural beauties of Szigliget offer opportunities for walking and riding a bicycle all year round. Walking along the Kamon-kő study trail opened last year, you can get to know the traditions and the natural beauties of the settlement.